Pomegranate Fern Leaf Lokta A4 paper (pack of 25 sheets). This light-coloured paper is ideal for all your printing requirements. 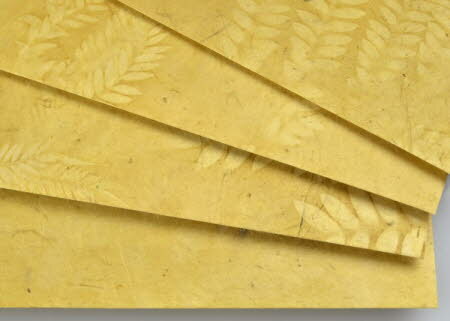 A very attractive pale gold-coloured lightweight 55 gsm paper dyed with pomegranate and imprinted with a repeated pattern of fine fronds of small fern leaves.